I met Genejosh last year. Not really met physically but virtually through our blogs. She invited me to become a sponsor in her first ever blog contest and without hesitation, I said "YES!". That became the start of a good relationship. And while we don't keep in touch much often because of our busy lives, I still feel a connection with her apart from the fact that we are both Sati's godmother. And this connection was revealed just a few days ago. We happened to have the same birthday! Haha! But seriously, the author loves to write. She teaches English in Thailand, so you don't even need to figure out why she writes very eloquently. Her and History is just one of her six blogs. 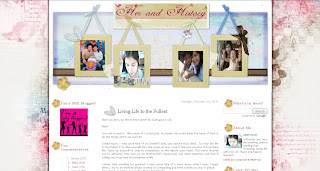 I think this is her main personal blog and she gave birth to it Dec. 15th, 2008 out of boredom, errr need to create an online diary of her own. And that was the start of her successful blogging career. I know that she would prefer to be a SAHM if given a choice because according to her, family time is indispensable. I so totally agree. Her blog entries cover various subject matter: from family life to her little Hyzyd, to her adventures in Thailand to memoirs back home, to reviews and meme entries. She's into blog reviews lately... I guess many of us, for the time being. I love the look of her blog. The photos of her family in the header show that her small family is growing and that this blog is the family's story, thus the blog title. I like the white background because it makes everything easy to read. The layout is three-column with the main page in between sidebars that contain useful links and gadgets. I think she could use a label widget though so that the readers will know what her usual subjects are. But apart from that, the blog is perfect! Head on over to Her and History today. And follow Gene's story.